You might think you know a lot about the people you follow, and who follow you, on Twitter. However, Social Bro is an app that might change your mind. 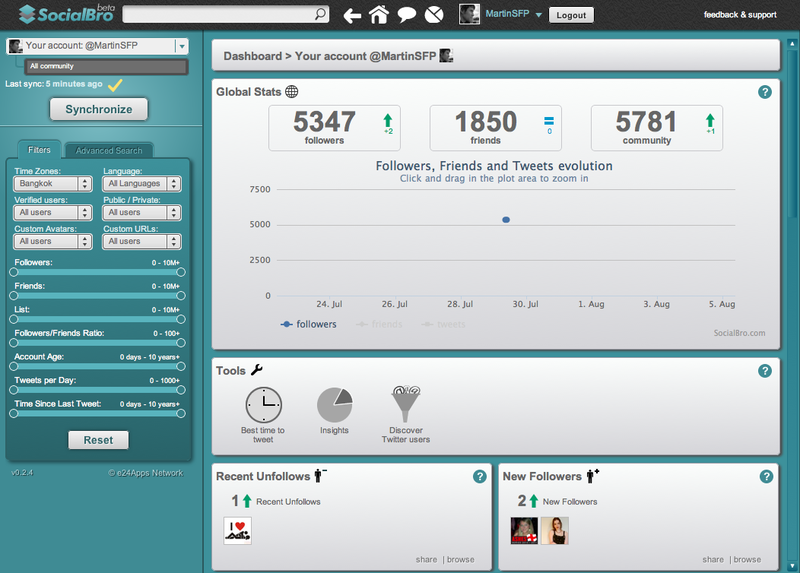 It lets you explore statistics that provide some interesting insights into your Twitter community. Once this Adobe Air-based app is installed, you have to register for an account. e24Apps, the company behind Social Bro promises to authorise new accounts within 24 hours, so you may have a short wait to get to use the service, which still in beta. 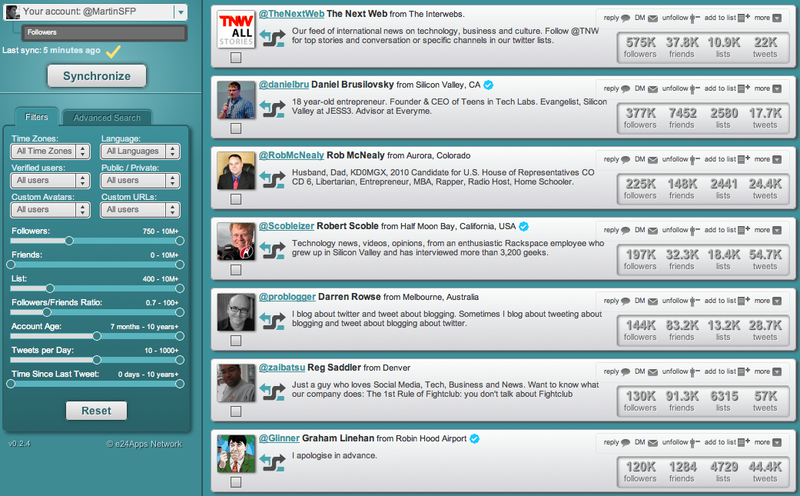 Once you’re in and you’ve hooked up your Twitter ID, it’s time to explore your community. The Home tab gives you a wide range of statistics, including a graph plotting your followers, friends and tweets; details of people who recently unfollowed you; new followers; inactive followers; your noisiest friends (those who tweet the most) and more. You can also ask the app to generate a report suggesting the best time of day to tweet. This is generated at the developer’s end and emailed to you when it’s ready. Meanwhile a set of slider controls let you explore your community in more detail. By manipulating the controls, you can easily see, for example, people who haven’t tweeted in the past year; the people who tweet the most; the people with the most followers, and which people you follow are in a particular timezone. Once you’ve narrowed down to a particular set of users, you can run batch actions on them, such as unfollowing or following them all, or adding them to a particular list – very useful. 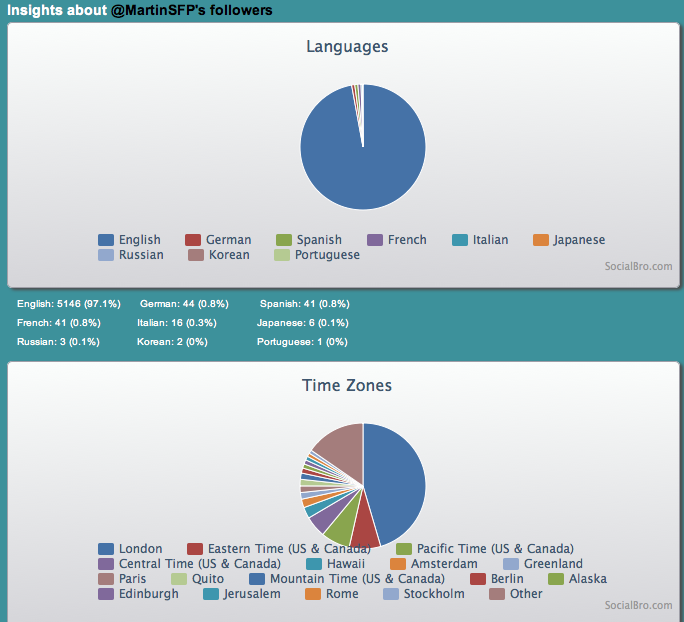 Finally, a Stats tab gives you charts, maps and graphs detailing the languages, timezones, locations, usage patterns and more of the people you follow and are following. Social Bro doesn’t do a lot that hasn’t been done before, but the fact that it bundles it all into a single app which you can use to explore all these statistics dynamically, makes it well worth a look. The information doesn’t update in real time, but you can synchronise with your account’s latest information whenever you like. Data can be exported as a PDF or CSV file too, if you choose. Spanish developer e24apps, which has previously developed other Twitter services like FriendLynx, says that SocialBro will only currently work properly with account which have up to 100,000 followers. However, the company is working on a special version which will handle these popular users. Social Bro can be downloaded here and you can register to use it within the app. Account approvals can take up to 24 hours, although my account was activated within 30 minutes.